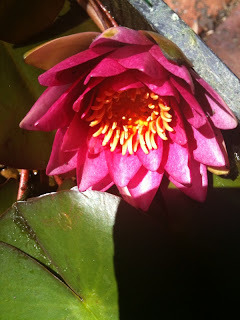 this is a tropical waterlily with a lovely perfume especially for the evenings in the garden. The flowers stand proud. 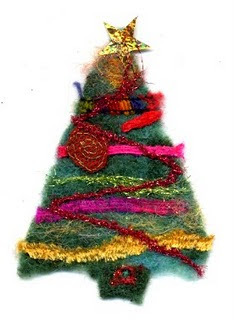 Wishing everyone a fabulous new year - the very best of health, happiness and extra loads of creativity. 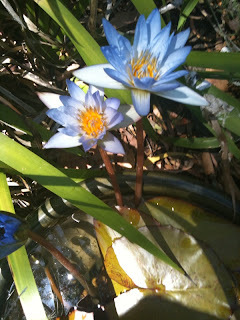 These wishes also come from my 2 new waterlilies - one happily in new pot, other one in bucket waiting but both happy already. I have removed the water clover to a minor spot since it is not a waterlily and is never going to flower and fed my other waterlily 3 big tablets as it hasn't flowered. I really only went to get 1 waterlily but it was a long drive up the freeway with hundreds of crazy drivers in a hurry to wherever (the grave yard?) so I bought 2 and a bag of tablets for them to eat. Have a wonderful night - we are staying at home, indulging in our favourite scallop dish and a chicken tandoor on our bbq and champagne. Maybe stay up to midnight - maybe not. This is one of the cats from next door - we have no idea what its name is but we call it Tinkerbell because it has a bell around its neck. It's a very curious cat and wanders into the house and the studio but is rather wary of us and quite independent. The people who own it next door don't talk to us but they are probably pleased their cat has somewhere to go every day - just as well we like cats. I am not at all sure why people in apartments have animals when there is nothing for them to do over there all day. It arrives about 5am because I hear the tinkle and at night when we are outside we hear it roaming around. This is the closest I could get to take a photo. 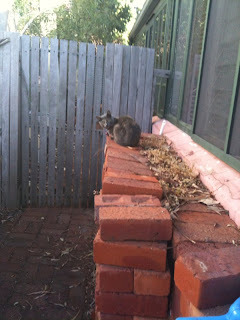 It has terrorized Mango who also lives next door and we think she simply hides somewhere in the garden each day. This little one is always very busy - Mango just sleeps. still hot - and yes I will swap your snow/frost/ice etc for a jar of heat. Have to say the evenings are delightful so maybe I won't. 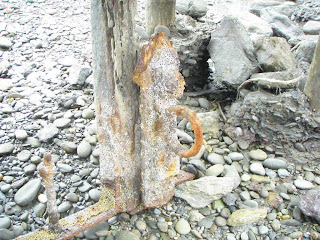 Here is something I came across at Okarito - how shall I play? Playing with my iphone is keeping us both busy - we have downloaded our itunes division and can use the phone as our Sonos controller which is really great. I have loaded some music onto the ipod but the earplugs are pretty silly really and I expect we will only fight about who is using it when we fly. 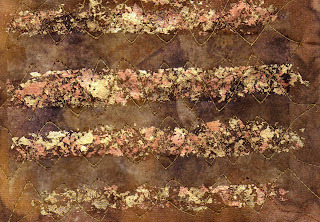 The camera is quite impressive and even Dale-proof - I took this photo of some stony layers I did yesterday - I thought I was transferring a TAP transfer which wouldn't work but it turned out to be just a photocopy - however since I had been applying painted fusible webbing, it stuck pretty well and I layered some chiffon over the top and added a little stitching. It will be a page in my Stone book. Holey Moleys - I am preparing for the next lesson in case you are wondering. Thanks for all the lovely messages - I hope you all had a wonderful day. We started with a lovely afternoon at Eva and Malachy's on Thursday and yesterday we went to Martine and Luigi's where they spoilt us as always with wonderful food. Martine cooked a paella and lots more. I took a summer pudding and even managed to find 5 mulberries from our tree to add to it. 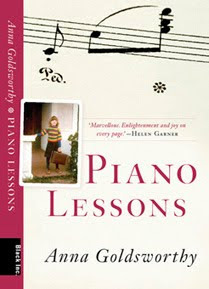 We also got books of course - mine is Piano Lessons - Anna Goldsworthy whihc I am enjoying - I don't feel I was such a precocious child pianist after all. 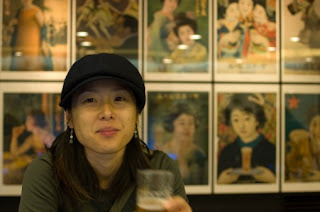 It is a delightful story and a tribute to her teacher. I had a wonderful piano teacher too in my high school years - Evelyn Rawlins - her studio was awe inspiring to visit - always exciting. 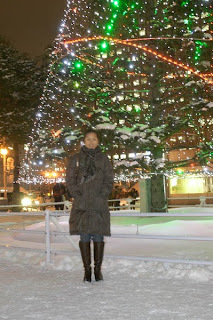 Christmas greetings to all who read my blog wherever you are - may you have a wonderful day tomorrow in snow or sunshine. Looking back at last year's message I had picked mulberries from our mulberry tree. I have been up to investigate but they are not ready at all this year. This year we are Darby and Joan but not quiet and lonely like we thought - we are off to Eva and Malachy's for Christmas Eve bbq soon and tomorrow to Martine and Luigi's for Christmas Lunch - so it looks like the good Kiwi Xmas dinner of roast lamb and all the necessaries and pavlova and homemade icecream will be on Boxing Day. The last of the orders have been done and we are having 2 days off. SO we can play with our Christmas Present waiting under the tree - what could they be???? No secret about the glue I have found to use with the metallic flakes - it's on our website in the catalogue with the flakes. 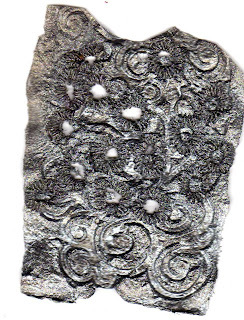 Here you can see I have used the glue and flakes on a piece of polycotton which had been previously sprayed with walnut ink and then stitched over it. I am very pleased with it as, like the double sided tape, it hasn't changed the handle and is smooth to work into and onto. I am also very pleased to say that I have finally sent up my thread order for the Earth Elements collection. I think this has taken me all year by the time I procrastinated but here is the last set of colours for the 4th variegated - Middle Earth - I had a hankering for that deep turquoise because I reckon I saw it in Middle Earth when we were in NZ. Hopefully the collection will be dyed and ready in the early new year but I guess they take holidays too. The whole collection will be available in fibres and fabrics and hand threads including plain colour six strand floss. 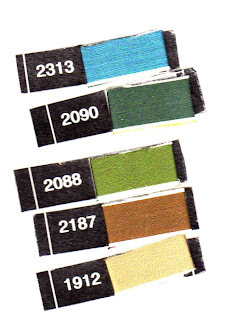 Actually loking at the colours I have scanned you would never know it is a dark turquoise but do take my word for it. Couldn't resist some last little flowers and now I have finished all my stitching for the flower stitcher book. This one is for all those people coated in snow in the northern hemisphere - no chance for little flowers to relax in the sun but plenty of lilting ones here today - we have hidden indoors but I am about to go outside and plant my herbs. 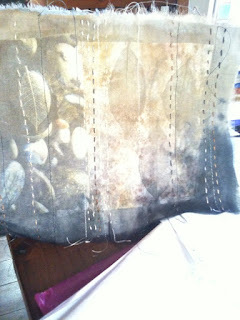 I have found some fabulous glue which works on fabric with the gilding flakes - very pleased with this. Wow - it is raining big rain drops - we have loaned the car to Grant so we will have to walk to Koinonia with our umbrellas - they are off on holiday for 2 weeks tomorrow so we thought we would go and eat there and wish them a happy holiday. 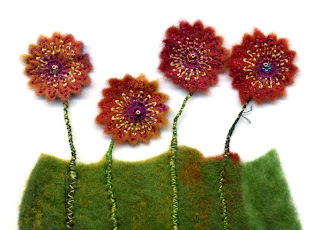 I really have finished all the pieces for the Flower Stitcher book but I couldn't resist a little Australia - my apologies to the good people from Tassie - you are a little close to the mainland but the Kunin felt kinda shrunk up. But on the other hand I didn't forget you..... 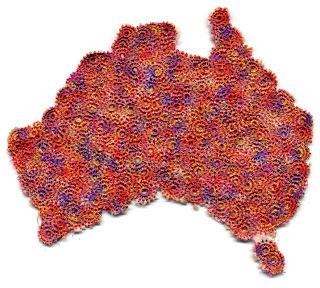 It is quite difficult to fit little flowers to the actual shape of Australia - I think I have only moved the coast line a wee bit in places. 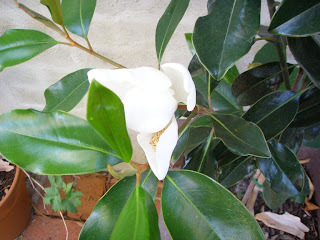 Here is a flower from one of our Magnolia trees - one gets more water than the other and is flowering and growing taller - have to do something about this. The flowers don't last for long. This is the worst time of the year for Eucalyptus bark to fall - it is still everywhere - I have to make a track through the back garden every morning. Loads of leaves and pods falling as well and little branches. 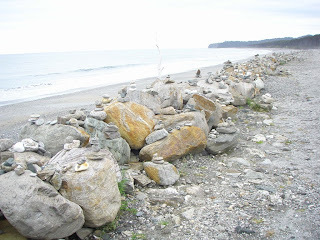 I collected a number of stones from Okarito - this flat one is beautiful - I am going to stitch and layer coming up - but just one more flower stitch piece to do for the inside back cover. And then I really will stop. For the moment. There are a couple of new textile magazines coming out in Australia - one is Downunder Textiles from the good folk at Downunder Quilts and the other Embellish from the good folk at Yarn and Felt. I am interested to see how they will go. What am I reading in bed? 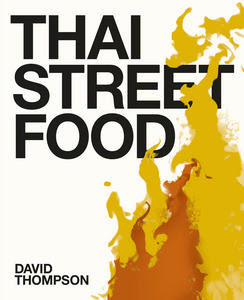 I am indulging myself reading lovely new cook books - Thai Street Food is a fabulous book with wonderful photos of parts of Thailand for starters. It is so big that when I hold it up in bed to read a few more pages, my arms nearly drop off. David Thompson said in one interview that if you cook 4 dishes from a cook book you are doing okay so I figure that it's okay to indulge. I have his earlier cook book but I haven't cooked from it to be honest. It always seems easier to pop down to one of our favourite Thai restaurants instead. 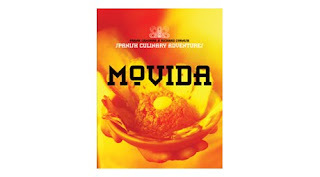 And I have the first book from MoVida and waiting for the postie to bring the latest one. 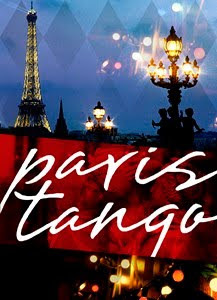 No wonder we are thinking of a visit to Spain next year - it's a fabulous book. 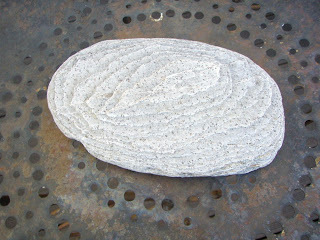 And this one is cookable from. I have lots of cookbooks and I really do love cooking. At this time of the year I am always on the lookout for good salad recipes - simple but super. So we can indulge on our bbq. 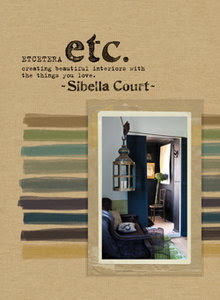 And not a cook book at all but Sybella Court's book Etcetera is an inspiration in itself. I wonder what book I will get for Christmas? Can't have Christmas in the Rollerson house without a book or two. 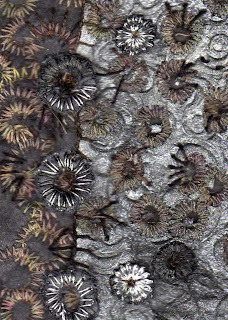 A little more fun using the flower stitcher - I am still on the stonehaven theme but seem to have added some little fossils as well. This top sample has been sprayed with Black Orchid Silver Starburst Spray which is why you can see a shimmer if you enlarge it. 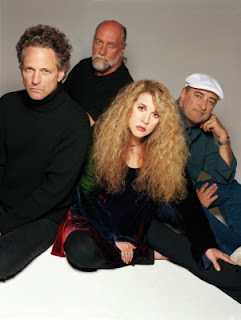 Very hot today and I am hiding in the studio with the air con on - outside a man with a loud mike is 'testing one two three' - I thought he did it all yesterday - yes we have a second Fleetwood Mac concert tonight but we are off out with Eva and Malachy. Grant is down for the weekend so we had breakfast with him this morning and we escaped from the concert last night when we went off to pick him up from the airport. 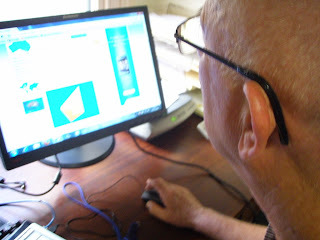 And a message to all the wonderful participants in the Connections Challenge - I have started sending your work back - I may stop now until the new year just so it doesn't get caught up in the Christmas rush so you should receive them in January. I hope you have all started on your Textile Tantrum. 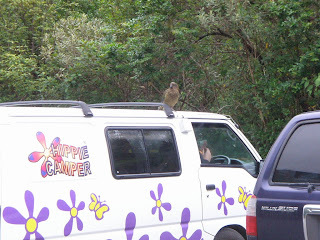 back in that carpark there was a very friendly Kea. Loved being photographed. They pinch anything and there are always notices not to feed them. 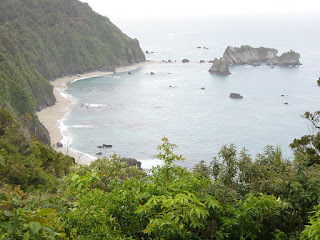 We drove into Okarito - my very favourite place. Always inspiring. 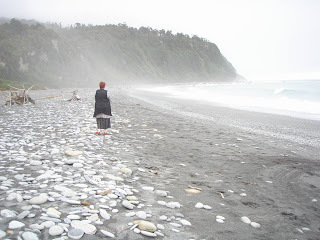 Here I am on Okarito Beach - I collected for myself a beautiful big stone - I figured that I had plenty of space in my suitcase for a few stones. 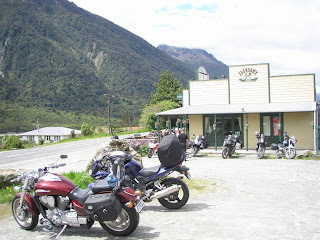 When we left Reefton (forgot to take any pics but it was good to catch up with Ian's rellies - and it looked the same, we drove to Christchurch over the Otira Gorge. Called into Jackson's Tavern for a very nice home made pie - there was lots of other people there enjoying pies and beers in the middle of the day. 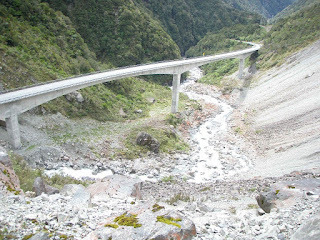 Here is the viaduct over the Otira Gorge - just like being in Italy. I haven't been over here since I was a teenager. 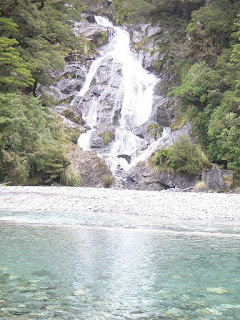 Well Virginia - I will admit it does rain a lot of the time on the West Coast - but it's friendly rain and helps the bush with its lushness and beautiful colours and the stones like it too and so do the waterfalls..... 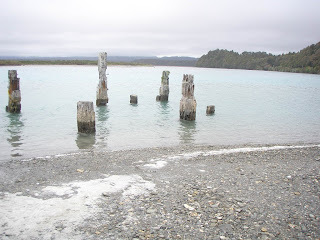 It wasn't raining here as you can see - Bruce Bay - wow Bruce - a bay named after you and a beautiful spot as well. 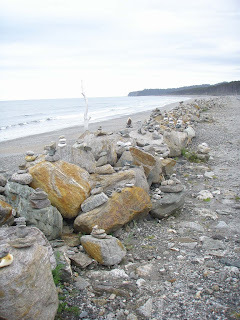 some more rock pancake stacks. Appropriate for Grant and Bruce but I don''t remember stacking them - they just ate each one in turn as I made them - in fact faster than I could make them. Then we went to dinner at The Beaches - nice food - interesting combos and the waitress did try hard. Maybe a new keen chef trying to pop rather too many flavours on the one plate but it was most enjoyable. Nothing as over the top of the overkill of beetroot Bev and I had in Havelock North last year. 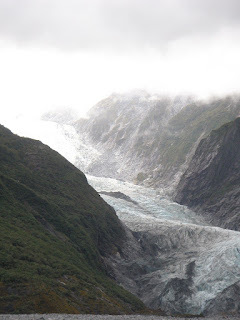 In the morning we went to the glacier at Franz Josef - the weather was great but it started to close in when we were leaving. Middle Earth can roll in quite fast. 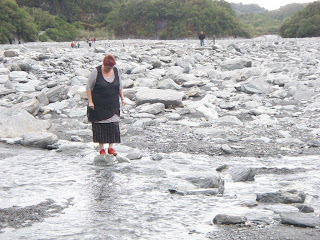 Crossing a little ford - I think Ian was hovering with the camera in the hope that I might fall in? 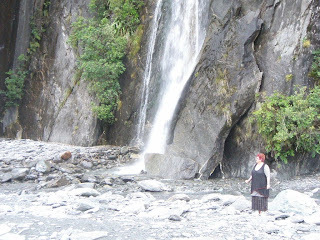 One of the beautiful waterfalls you might see on the West Coast - this one was around the glacier area. 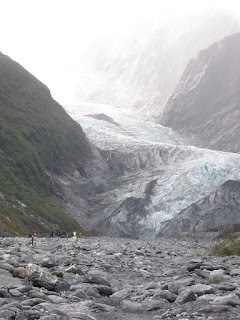 Here is the glacier in its glory - if you haven't been to NZ then you must visit the West Coast when you do - rain, green, not too many people and it even looks tidier than it used to. And the scenery - well...... I am not a red dirt girl - my soul needs this environment for recharging. 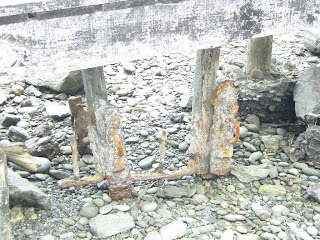 Don't forget to click on the pics to see more detail. We are pretty busy here - Studios and Art Quilting Studio have arrived and quite a few new books - Ian is hoping to get stuff on the web tomorrow and Quilting Arts is due on Friday - you never know when these mags are going to arrive these days. I am hoping to get into my studio tomorrow to put things away and get to my machine - just need to finish the last pieces using my flower stitcher. 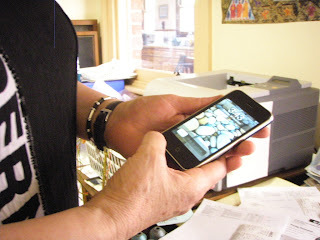 Rae and Jacinta are busy sending parcels of goodies for restocking. It's been exciting opening up the parcels - Rae is adding crinkle silk to her range - the first few are rather scrumptious and I am going to take one to use with velvet on the embellisher but not before I finish my book stuff. It should be ready to go to the printers on Monday I hope. 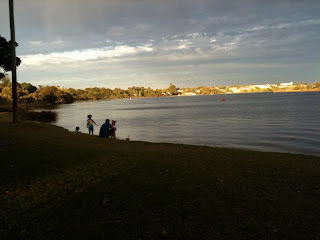 I am back from Sydney - a good 2 days at the Texstyle conference. 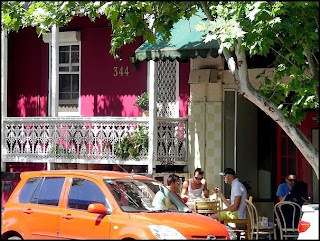 I stayed in Surry hIlls and on Sunday after it was all finished I spent a few hours wandering around the area espcially around Crown Street. It was a lovely day and loads of people were enjoyuing themselves. Day 1 wasn't quite so easy - too many people and nowhere to breathe but on Sunday I had another larger room with access to power and a place to put all my stuff and we all seemed to have a good constructive time. I hope the teachers who came to the workshops got something out of it all. I flew back this morning and the flight seemed to go on for ever. We are here for some time now and of course we will get restless again before too long. 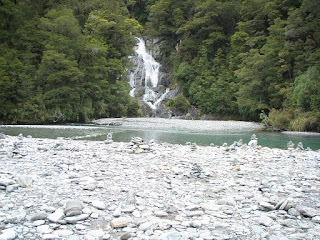 Back to NZ though - we had a great short time but it was very relaxing and we thoroughly enjoyed the surroundings. 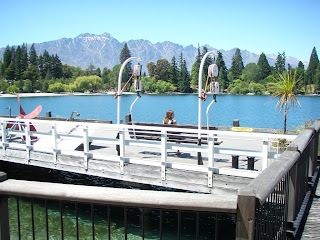 This is Lake Wanaka on the morning we left - the day before it was brilliant sunshine but this morning it was a little mysterious. 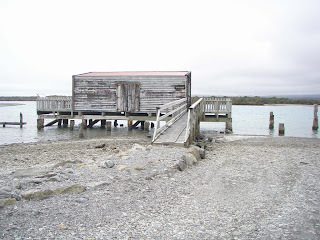 We drove from Wanaka up to the West Coast via the Haast Pass - mmany years ago I actually went to the opening of this - my father must have had a desire for a trip to see a ribbon being cut. 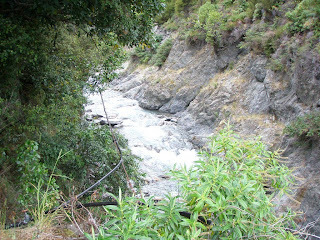 Love these streams and the surroundings. 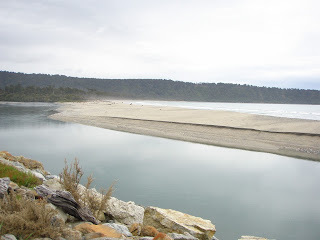 This pic is of Knight's Point - once you get over the Haast Bridge you head up to here. Often photographed. It was raining but then it often does on the Coast. 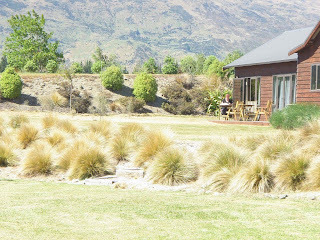 Just arrived tonight from our lovely relaxing soul filling week (almost) in New Zealand. 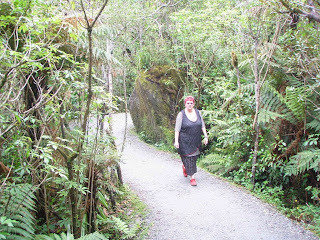 I love the west coast - I know we were on the south island west coast (where Ian is from) but in many ways it is similar to the north island west coast (where I am from). 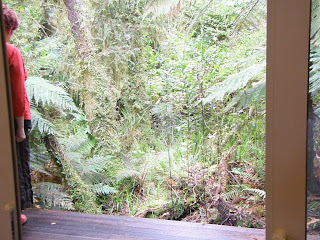 The colours of green and the bush and even the rain are fantastic. If it ever stops raining on the coast then we really all are in trouble. 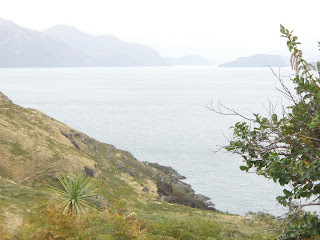 The pic above is Lake Wakatipu - the lake at Queenstown. Very famous - lots of tourists. Goodness knows what I am doing but we drove over the Crown Range and stopped to admire the view - a glorious day. The flight in was superb - it's a bit special to see the mountains capped with snow. Very busy since we landed - I have answered most of the emails, pulled most of the orders, gotta get up early to do the washing and pack my bags to go to Sydney tomorrow afternoon for the NSW Texstyle conference. Ian will be busy... I will be back on Monday late morning so no dramas. Thanks for all the lovely comments - we did have a very nice night out for our wedding anni - we are amazed they still go on and on!